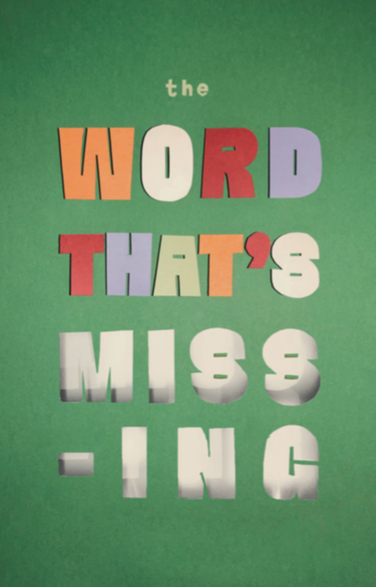 “The Word That’s Missing” is anthology is a collection of ekphrastic poetry written by 12th grade students at the High School of Fashion Industries in Manhattan. Ekphrastic poetry is a poetry of description, in which the poem must surpass that which it describes. After studying sources from theatre and film, these young writers used poetry to describe stories and scenes, themes and motifs. The resulting poems explore small moments and grand events. They mine the minute and the hidden for what is most significant. They search the cataclysm for what has been forgotten. Not only do these poems transcend their sources, but in an effort to find the word that will describe and surpass, in an effort to find that word that is missing, they transcend ordinary language and invent new ways of thinking, speaking, and seeing the world. her ability to articulate perfectly. you are deserving of that thought. You can purchase a copy of “The Word That’s Missing” at the Brooklyn Superhero Supply Co. or online here.